Photovoltaic installations are becoming more and more popular. DISTEK is providing necessary equipments for test, control and maintenance of single and three phase photovoltaic systems, energy analysis conforming current standards. While the costs of components are decreasing and their performance is significantly booming up, the photovoltaic installations are very common either on buildings’ roofs or installed on the ground. The problems involved in the installation of photovoltaic systems, however, are to be solved in terms of safety, testing and maintenance requiring specific solutions. The photovoltaic installation is an electrical system under all respects and its safety must be certified in compliance with the regulations in force. As the photovoltaic modules are installed outdoors and directly irradiated by the sun, they are subject to extreme environmental conditions such as hot weather in summer, frost in winter, rain and hail etc. All this makes safety testing even more necessary. 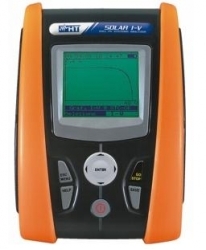 Safety is not to be neglected in the assembly and maintenance of a photovoltaic installation. The regulations in force state that quality marks and certification on components are not enough and that an instrumental measurement is required. To apply for special tariffs the electricity user needs to provide a test certificate along with sundry documents. This document certifies that the installation ensures a minimum efficiency level. It is therefore necessary to employ measuring instruments bringing about significant practical problems. In a typical building installation modules are usually placed on the roof and the inverter is often in the basement. Such a condition is critical because, to test the equipment both electrical and en-vironmental parameters are to be measured simultaneously even though very far from each other. 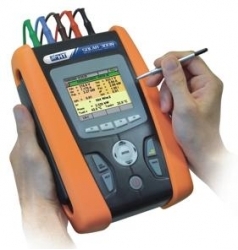 Only the use of suitable equip-ment can grant correct measurements carried out in a suitable, fast and convenient way. The outdoor installation, with consequent exposure to extreme environmental conditions, can lead to a rapid deterioration of the modules as well as a sharp decrease in the performance of the whole photovoltaic installation. The energy produced and the consequent economic benefit can be reduced considerably. It should be advisable therefore to periodically check the installation comparing the performance of the modules as specified by their manufacturer. By measuring the module I-V feature and comparing it with the rating you can assess whether they are granting adequate performances, whether any decrease falls within the natural performance decay, or whether one or more modules are faulty. In this case you can pinpoint the damaged modules and promptly replace them. Why to use a reference cell? - spectral composition of solar radiation; etc. - it grants a quick response the same as the photovoltaic modules. This last feature is crucial in case of measurements taken under conditions of variable cloudiness.